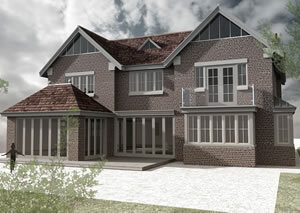 I am a registered architect based in Winchmore Hill, near Amersham in South Bucks. I have extensive and long experience, having worked in various local authorities and private practices before starting my own practice in 1992. Most of my work is in the residential sector - new houses, house extensions, and extensions to care homes. Normally I see projects through from start to finish. The project starts with an initial briefing session, followed up with a survey if necessary. The next stage is to produce sketches of various ideas and approaches to find a design that suits the Client. There may be two or three meetings for this purpose before the final design is drawn up and submitted for planning permission. Once this has been received, the working drawings are prepared and Building Regulation approval obtained. Tender documents are sent out to builders for competitive prices. I can advise on suitable builders, as I keep a list of local builders who have done good work for me in the past. The qualities I look for are good workmanship, politeness to the Client and neighbours, keeping a tidy site, charging a reasonable price - both for the initial tender and for variations, keeping to programme, and keeping the Client informed of the work schedule. I do a tender analysis report for the Client, and arrange for signing of contracts. The contract form normally requires monthly payments to the builder in arrears, with a retention sum of 5% of construction cost; half of which is released at practical completion. At the building stage I make regular inspections of the work, answer builders' queries and deal with any problems. I guide the Client if decisions are required, and advise on payments - when they are due, and what amount. Six months after practical completion I do a further inspection for latent defects. When these are cleared by the builder the final 2.5% of the contract sum is released. I love designing, but I am very thorough with all the work-stages. My aim is to have a well-designed building which the Client is very happy with. It is impossible to guarantee planning permission. Most applications receive approval at the first attempt. Those that don't can usually be modified to everyone's satisfaction to obtain the approval. Sometimes I have to speak at planning committee meetings to argue for a submission, and sometimes to fight planning appeals: many projects have been saved in this way. This website presents some of my projects, including developments in Chalfont St. Giles, Marlow, Gerrards Cross, Beaconsfield, Holmer Green and Maidenhead.